Trying to find a sign to fit a narrow space? Check out our variety of vertical signs! 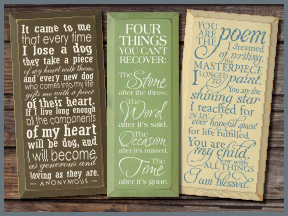 Ranging from funny signs, to sentimental signs, we have numerous options for decorating skinny wall spaces! With over 40 colors to choose from, your solid wood sign from Sawdust City will look great anywhere!